Most people who buy a pickup truck have purchased such a vehicle due to its practicality. Sometimes people attempt to make their trucks a bit more usable by applying helpful parts like a bed cap or tonneau cover, winch or off-road focused upgrades. Then there are those who place style before functionality and install bigger wheels on their trucks or a lowering kit. If you fall into the latter camp, then allow us to introduce you to the 2019 Chevrolet Silverado ZR4 Interceptor from AirDesign. The American aftermarket parts company first showed the ZR4 Interceptor upgrade kit for the 2019 Chevrolet Silverado at the 2018 SEMA Show in Las Vegas late last year. The kit, which is a full body upgrade package for the 2019 Silverado, includes a three piece lower air dam, cab roof extenders, tailgate extension pieces, side skirts, a rear fascia extension and rear tailgate applique. 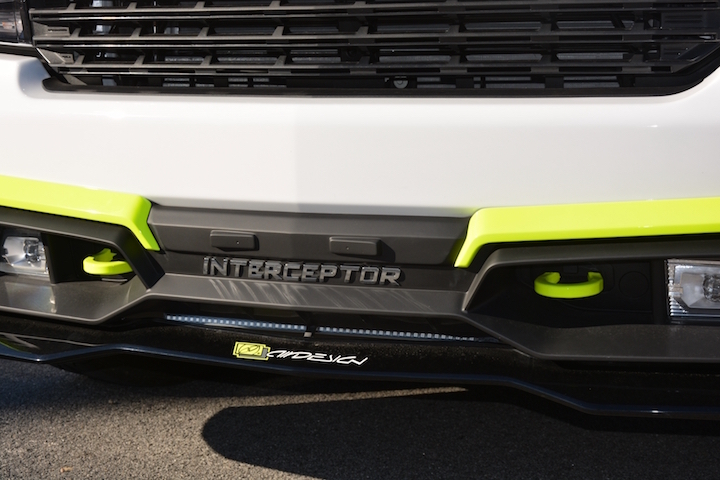 The front air dam/fascia extension is functional, helping to channel air into the pocket that General Motors worked into the 2019 Silverado’s front end. 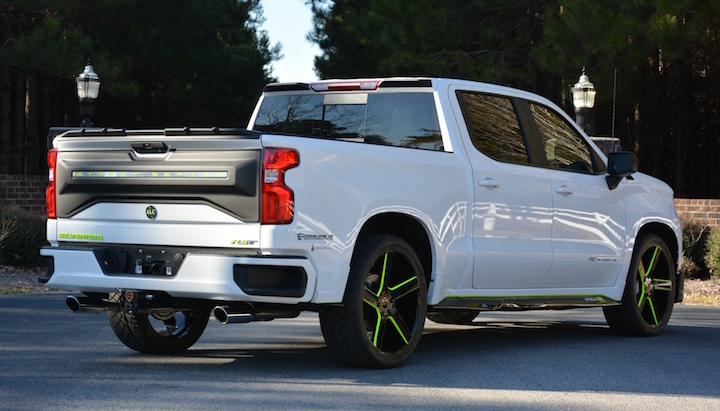 AirDesign’s show truck also features contrasting painted parts, a hood scoop, large aftermarket wheels and ZR4 badging, among other upgrades. AirDesign Interceptor ZR4 kit is available to order from the brand’s website for $1,290 USD. It will fit the 2019 Chevrolet Silverado Crew Cab only. Pull the F150 Platinum/Limited trim from the tailgate, and the god awful highlighter yellow paint, and it might be something. But really, a factory fresh RST with 22″ rims looks better for a street focused truck. And likely with the money saved you could lower it and get a custom tune, and get a vinyl shop to add some strips or decals or accents. Im suprised anyone even offerd such a product for the new Chevys. The proportions are all brawny, tall and rugged. Theres no ” sport” at all in any modern full size pick-up. The best you can do with a nod towards performamce is to slam it and throw abunch of money at the engine and exhaust. Hopefully afterward, everyone else may look past your attemps at hot rodding a 6000 lbs, 20ft long, brick on wheels. The only way to make this better is to have someone over age 8 actually draw a complete new front clip. Keep the hood, ditch the front fascia all together and start over with your front fenders that doesn’t look like you copied a Saturn vue after a night of drinking. A body kit…Really? The truck is already ugly AF.